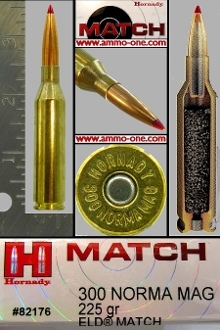 One Cartridge, not a box: .300 Norma Magnum, by Hornady Manf. Co. USA , factory loaded using new Hornady brass cases with “HORNADY NORMA MAG” Head-Stamp and loaded with a 225 grain MATCH GRADE(Heat Shielded Jacketed Hollow Point) projectile. History of .300 Norma Magnum cartridge: The .300 Norma Magnum (not to be confused with the .308 Norma Magnum) was introduced in 2012 by Norma Precision A.B of Sweden. It is basically a .338" Norma Magnum case, necked down from .338" caliber or .308" or 30 caliber. velocities over 3,000 feet per second. In 2016 the United States Special Operations Command (SOCOM) selected the .300 Norma Magnum as their new Advanced Sniper Rifle Cartridge, making this a military cartridge as well as sporting rifle cartridge.